Upekkha is a critical quality required in a Thai Massage practitioner. In Pali the word means Equanimity and it is one of the perfections required of a Bodhisattva. So what does equanimity mean from a Buddhist point of view. Equanimity means unflappable in stress, cool or calm. However this coolness must be maintained consistently both internally and externally. Now equanimity is not a difficult concept to comprehend if you are fan of Kung Fu movies from Hong Kong. The Kung Fu master pirouettes gracefully through the air while evading swords, dagger and 108 poisoned tip arrows. All the time maintaining a calm Buddha face. However since most of us will rarely ever have to evade 108 poisoned arrows at the same time how shall we experience equanimity in our daily lives? 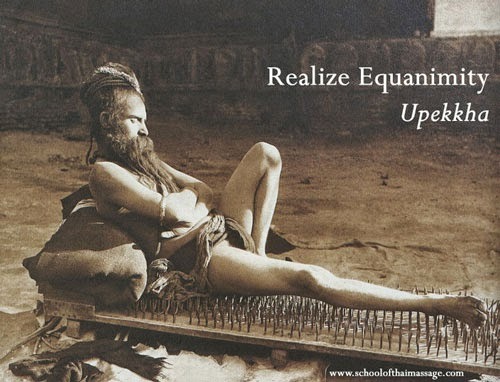 As a Thai Massage practitioner getting to Equanimity means being detached from the egotistic point of healing. Like claiming that “I” can heal some problem in a client. Or to say that one is great healer. These statement and mind games are traps to destroy any equanimity one may have. A good rule to find equanimity is to be detached from the fruit of one’s work in this case payment to be received or an expectation “I shall heal this person.” It also helps to understand that one is merely a part of karmic cycle in the client’s life and one may or may not heal the client. All one can do is to do their best with out any expectations. Therefore a practitioner with Upekkha will spend the session time sensing and feeling sensations she is feeling from the client’s body while working on them. The practitioner should also be mindful of sensations in their own body. However the best exercise that aids with developing Equanimity is suffering. Equanimity comes to one who has suffered a lot and not tried to escape the suffering. Instead she has pushed through the suffering to realize the temporary nature of all phenomena. Such experience is invaluable in building Upekkha as depth of suffering builds detachment. Even Lord Buddha who lead a cozy protected life in a palace as a spoilt brat could only find enlightenment and equanimity once he escaped the palace and spent the rest of his life in hardship and suffering. In the Prajna Parmita Upekkha is defined as “Even Mindedness” or “as neither impassioned nor dispassionate”. Upekkha is realized when we neither run towards or hold on to pleasure or the sense objects that provide pleasure nor do we avoid or run away from pain. Instead we try and sense them with equal mindfulness. The opinions and advice expressed within this article are the personal opinions of the author. School of Thai Massage is not responsible for the accuracy, completeness, suitability, or validity of any information on this article. All information is provided on an as-is basis. The information, facts or opinions appearing in the article do not reflect the views of School of Thai Massage and we does not assume any responsibility or liability for the same. Got ideas, experiences to share on Yoga, Thai Massage, Healing, Healthy Living or Spirituality? Write for us and get published. Mail your article to [email protected] Please copy paste your text into your mail. Do not send word or pdf documents they will be deleted. Please add your title in the subject line. Articles must be in English, well researched and must not have been published anywhere else before. School of Thai Massage reserves the right to publish your work. If we decide to publish we will inform you by mail. Images if available for the article will be requested separately.